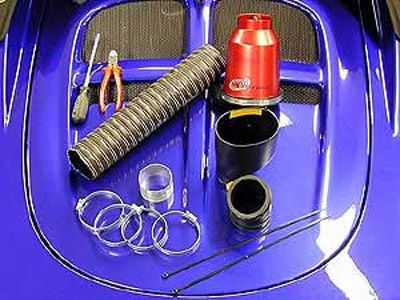 The Hurricane Induction system was developed by elise-shop.com for the Lotus Elise S1 and S2. It combines the advantages of a sports filter and an airbox all in one. Unlike the original restricted airbox, this system takes cool air from the left hand side air vent. The cooler the air you can get into the engine the more power it will deliver. - Less resistance by using larger, but also internally flat ducting. - Less turbulence due to a specially designed filter cap. Using the advantage of the sports filter and the cold air intake, power and torque is improved! This kit includes a silicone connection hose which connects the Throttle Body to the filter box. Please select colour of this hose..